6.2. 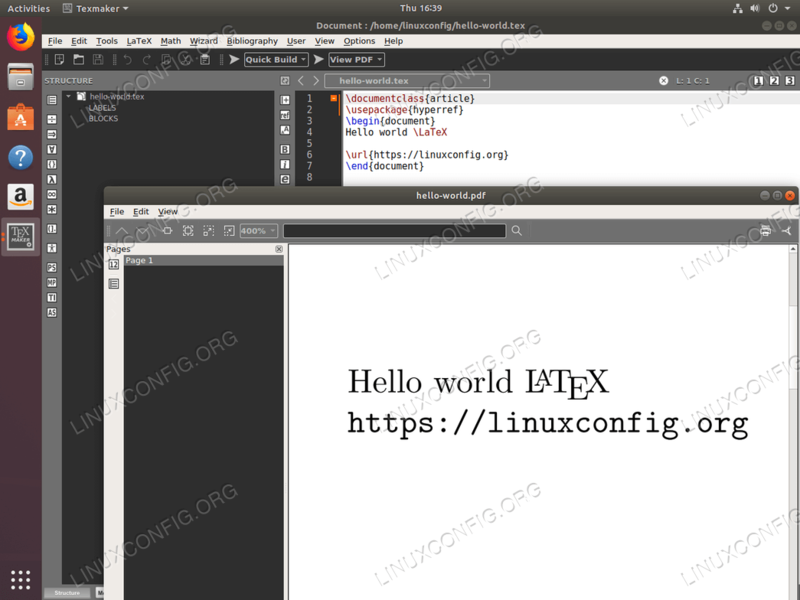 Compile LaTeX "Hello World"
The objective of this article is to provide reader with instructions on how to install LaTeX on Ubuntu 18.04. Furthermore, this article will also explain the procedure on how to compile a basic Latex document from a command line. 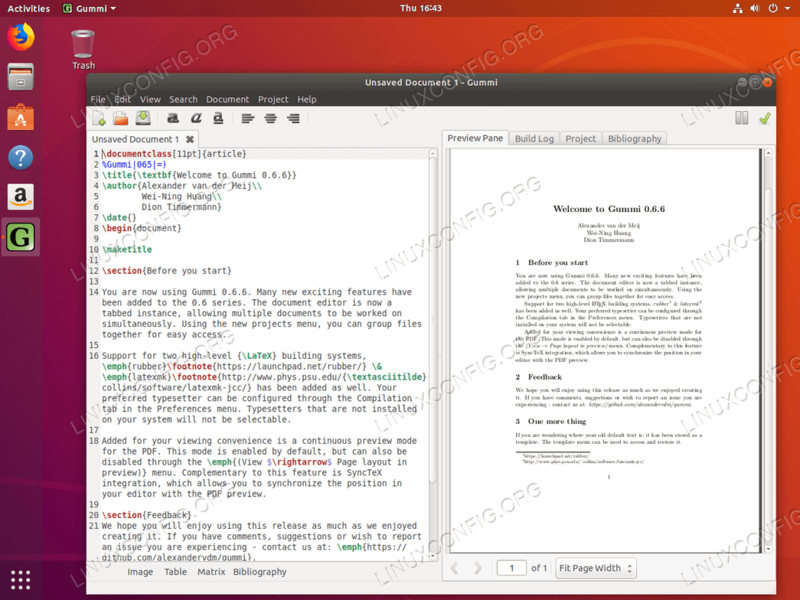 Lastly, the reader will be introduced to some of the best LaTeX editors available on the Ubuntu 18.04 system. The first package texlive-base will install just the basics to get you started with LaTeX. texlive or texlive-latex-extra is most likely the best way to get started for most users. However, our package selection is only motivated by the requirement for the least disk space consumed after the LaTeX installation. If you have plenty of space and a good download speed nothing stops you to go for texlive-full package. But be aware that this package will fetch the whole lot, including, but not limited to, eg. Japanese language pack. Now, that we have LaTeX installed let's just confirm the installation by compling a simple LaTeX code. 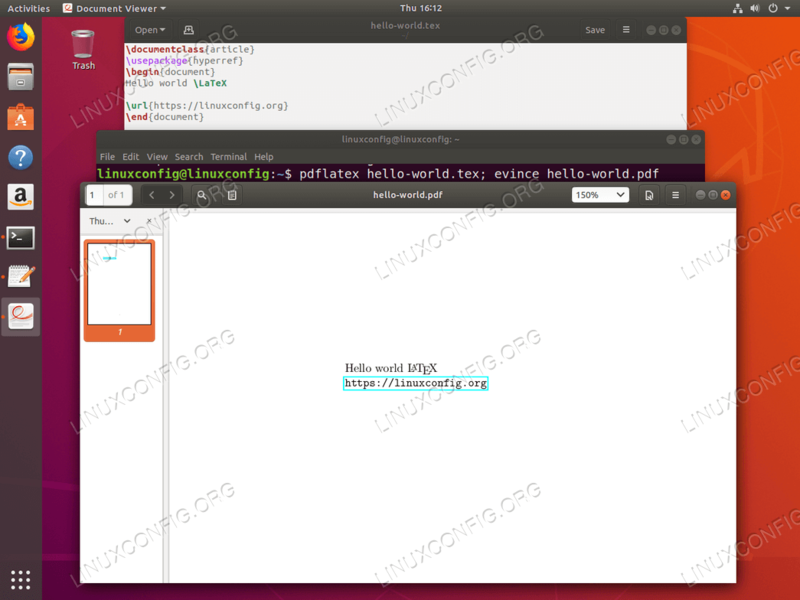 Compile LaTeX to PDF from command line on Ubuntu 18.04. The following section will provide you with a list of some of the best LaTeX editors on Ubuntu 18.04 system. Gedit with LaTeX plugin enabled. Gedit is most likely already available on your system. 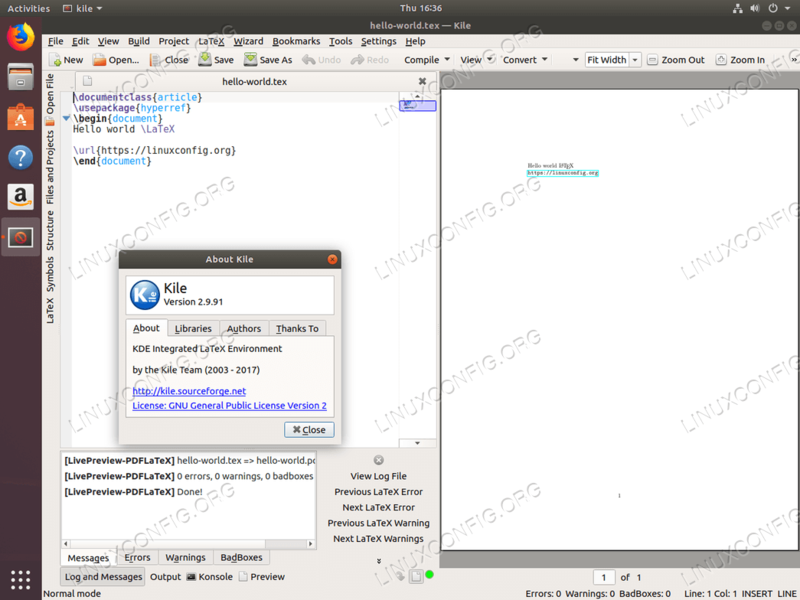 However, to get LaTeX support you need to install the LaTeX plugin via gedit-latex-plugin package. Once the package is installed navigate to Preferences-->Plugins and enable the LaTeX plugin. LyX is more sophisticated and dedicated LaTeX editor with a great documentation to get you started in no time. Kile is a robust LaTeX editor. It is based on Qt and hence the installation on non-plasma KDE desktop will require more disk space. However, it is surely worth every byte of your disk space. TeXstudio LaTeX editor is also a solid choice. It is feature rich with great neat interface. 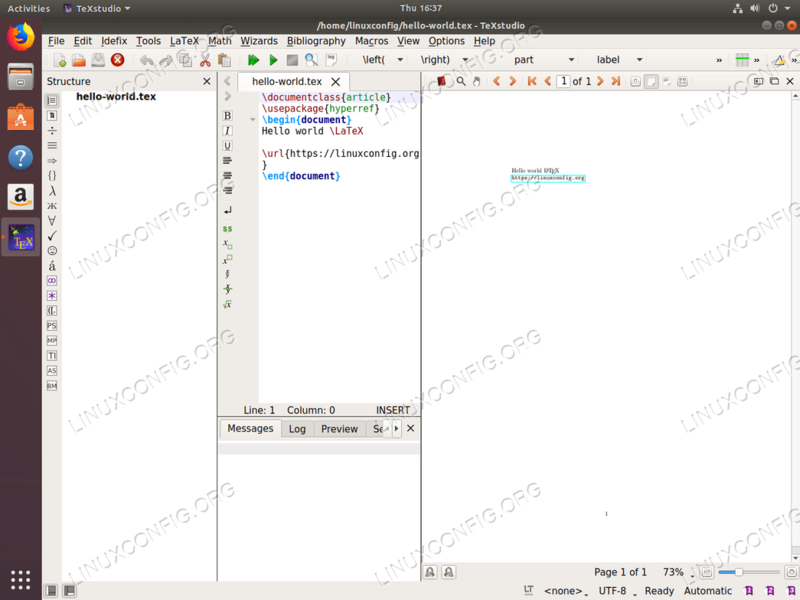 Yet another LaTeX editor and compiler is Texmaker. 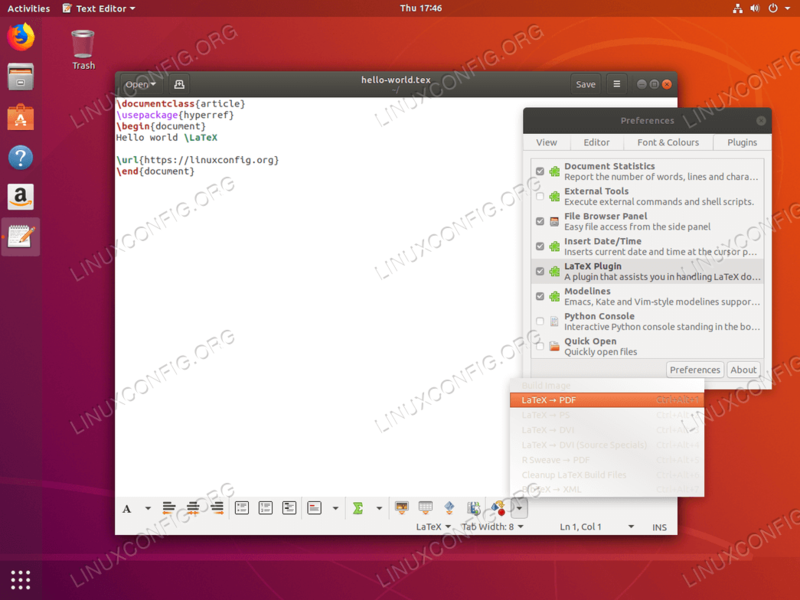 Lastly, you may opt-in for Gummi LaTeX editor and compiler. The nice default feature on Gummi is auto-compilation of the LaTeX code to the right hand side document preview.